A POS system will allow you to complete customer transactions – and fast. But thanks to the latest technologies in POS systems today, they can do way more than that. Before you start looking for your next business POS system, it’s important that you consider what features you want your system to have. More specifically, think about what features will cater to your business, whether you run a restaurant, bar, retail store or even hotel. Restaurant owners who are looking to purchase a complete POS system should look for features that will help them manage expenses and prevent overstaffing. For instance, POS systems that include a sales forecast report can help restaurant owners manage labor more effectively. These systems do so because they provide accurate numbers to support tight scheduling with the right amount of staff for each hour a restaurant is open. Some POS systems can also provide real-time labor alerts that will allow a restaurant manager to send staff home to cut down on labor costs during a slow day. Loyal customers want to go to a bar “where everybody knows your name”. Bars can take advantage of POS systems to improve customer retention and keep regular customers coming back for more. 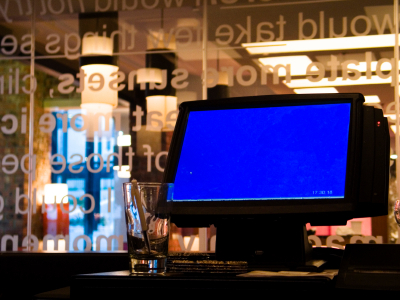 Bar POS software can include features like guest tracking and contact management, which provide a customer’s order history. Imagine it: being able to look up a regular’s tab and bring them their favorite beverage without even asking. Many hotel POS systems are easy to customize to the unique needs of individual hotel chains. For instance, having a POS system that accepts gift cards and customer rewards system is a great feature to have; it will allow customers to track points for each purchase they made with a hotel, greatly increasing customer loyalty and hotel sales. For retail businesses that also ship products to customers via a website, a POS system with the ability to track orders and invoices is a must. This program will give you the capacity to manage any online orders that have been placed to determine if they have been shipped and billed to the customer. Retail stores must be able to satisfy customer’s concerns effectively. Having a POS system that will support both in-store and online orders with quick preparation for shipment is a good start. For the best results in customer satisfaction and improved sales, take the time to shop for a POS system that will meet your business’ needs. POS systems technology is advancing every day to improve customer satisfaction as well as ensure security. Customers will appreciate your attention to detail when your business uses a system that makes their experience easier than ever before. Sylvia Rosen is an online writer who enjoy writing about the latest technology trends, such as how POS systems technology is advancing.